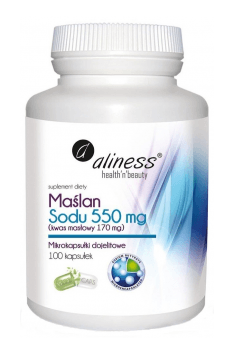 Butyrate sodium 550mg 100 caps. It is best to take sodium butyrate with a meal. Supplementation with butyric acid should be accompanied by a balanced diet rich in probiotics and prebiotics. A diet rich in processed foods, simple sugars and insufficient fiber supply can adversely affect the number of endogenous SCFA. Sodium butyrate is butyric acid sodium salt. It is much more stable than pure butyric acid, it does not have such a bad smell. In supplementation, it occurs in the form of a micro granulate, which is resistant to digestive enzymes of the upper gastrointestinal tract. The granules ensure the gradual release of sodium butyrate and distributing it over the entire length of the small and large intestine. Sodium butyrate is used in disorders of the digestive tract. It has been shown to have a beneficial effect on intestinal colonocytes and is used by them as a source of energy. In addition, it promotes the increase in the amount and size of the intestinal villi and improves the integrity of the intestinal mucosa. It may also limit the production of proinflammatory cytokines and stimulate the production of compounds with antibacterial properties. Dosing: according to the recommendation of a specialist. In prevention, the dose is usually from 150 to 300 mg of sodium butyrate per day. Butyric acid (butanoic acid) is an organic chemical compound belonging to the group of short-chain fatty acids (SCFA). In physiological conditions, it is produced in the large intestine by bacteria responsible for the fermentation of undigested carbohydrates. Butyric acid positively affects the condition of the intestines. It is a source of energy for intestinal epithelial cells (colonocytes) – it stimulates their growth and differentiation; helps to maintain the integrity of the intestinal epithelium and stimulates the production of mucus in the intestinal mucosa. In addition, it promotes a reduction in the level of proinflammatory cytokines in the gastrointestinal tract. Due to the characteristic and very unpleasant smell as well as the low durability, pure butyric acid is rarely used. Instead, for therapeutic purposes, salts of butyric acid (most commonly sodium butyrate) and its analogs (e.g., glycerol tri-butyrate, arginine butyrate) are used.